Last week we were fortunate enough to have blue skies all of Sunday. Dad was out in the garden, Mum was sunning herself on a beach somewhere off the south coast and I was revising. BUT, we still managed to find time to have a BBQ that evening. Tuna steaks have been a favourite of mine for a while now. Around the age of 16 I started going off the giant mound of blackened burgers and sausages that would invariably be served up at any family BBQ. I’d become more conscious about my weight and quite frankly was bored of the same old processed rubbish. Seafood came to the rescue as I soon realised that you could have fresh, healthy, non-processed food on the BBQ too! Nowadays I’ll be the person who rocks up to the BBQ with vegetable kebabs, corn on the ob and some sort of fish to stick on the Barbie. Today it was tuna. Tuna is so delicious cooked on the BBQ that sometimes I like to simply give it a few mins either side, and serve alongside a salad with a squeeze of lemon. This time, I decided to jazz it up a bit. I’d just finished marinating my prawns and looked around the kitchen. What could I do with my tuna? I found some olive oil, onion, and still had garlic to use. It needed something else… I headed on out to the garden and found my saviour. Rosemary! Perhaps not the most obvious flavour combination but WOW it really worked! I broke off the leaves from the rosemary sprig and added into a pestle and mortar along with the other ingredients and I gave them a good bash before brushing over the steak. As simple as that it was ready for the BBQ! Place all of the ingredients (except the tuna) in a pestle and mortar. Grind until all of the flavours have melded together. Rub into the tuna steak. 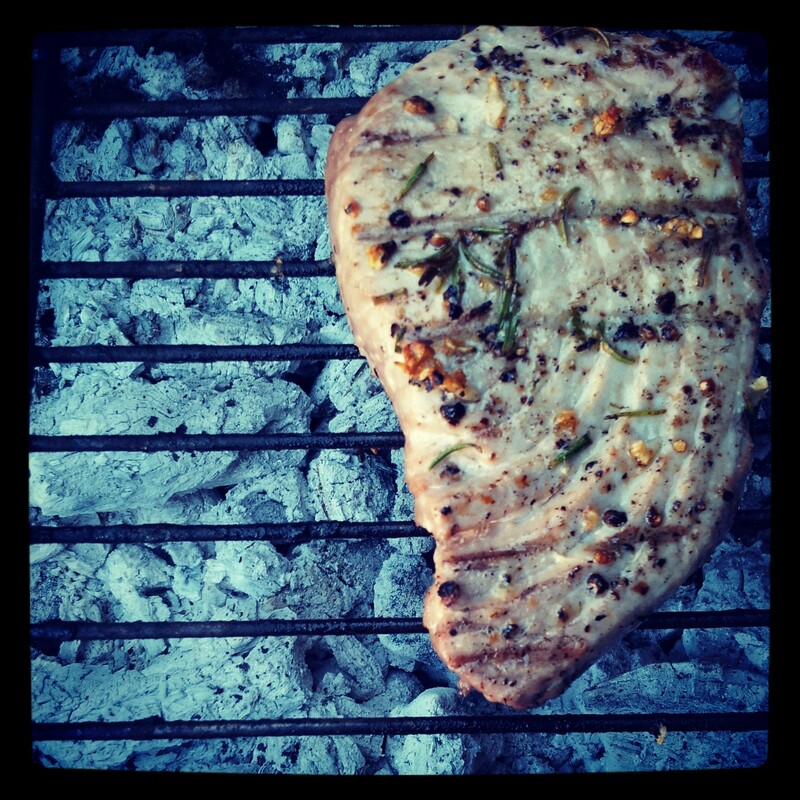 Cook the tuna steak on the BBQ (or in a piping hot griddle pan) for 3 mins on both sides. You don’t want to overcook it! Serve piping hot and fresh from the BBQ. But for me a BBQ needs fish! So now we’ve had Sizzling Summer Prawns and Char Grilled Tuna Steak, but what about the dishes that get served alongside the main attraction? Next week I’ll be sharing Courgette and Bulgur Wheat Salad. See you then!